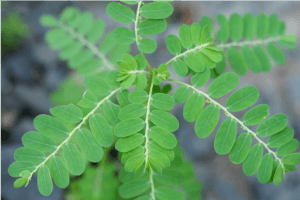 When you look out into your lawn, you may be asking yourself, what is the Mimosa tree–looking weed in my yard? It’s called Chamberbitter and one if its nicknames is actually Little Mimosa weed. It is a prolific seeder and has made its way across the Triangle from straw and other means. Chamberbitter typically germinates in mid to late summer and usually appears around pine straw and bird feeders first. Many experts believe it was introduced from Florida from pine straw about 15 years ago. This is a difficult broadleaf weed to control with the weed control products currently on the market. It’s hard to maintain because Chamberbitter is a very tough plant that grows fast, is drought tolerant and will flower and produce seed in as little as two weeks. In addition, many of the more common pre-emergent herbicides are not effective on this weed. To try and alleviate the spread, we identify our customers that have this broadleaf weed in their yard and try to make multiple weed control applications to gain some control on spreading. The knowledgeable team at Fairway Green can’t wait to help you with achieving the lawn of your dreams. If you have any questions about Chamberbitter, or any other weed that may be invading your lawn, give us a call!